A Brisbane based Principal Resource Management Partner (Minerals Australia East) and a mentor in our QRC/WIMARQ 2019 Girls Mentoring Program! A: Having grown up in Central QLD mining country, I was inspired by my parents to work in the industry doing field work that was hands on. A: From my high school days, I’ve always known I wanted to work in engineering and had my sights set on being a robotic engineer – robots fascinated me! 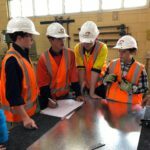 I was awarded a Summer Science and Maths School scholarship at the end of Year Nine, which I absolutely loved and it confirmed my love for STEAM. A: I became a Certified Delta V trainer for Emerson Automation Solutions whilst a technical training engineer 2014 – 2017. During my role as a Lead Control Systems Engineer for GE Oil and Gas (now Baker Hughes), I completed an internal 4wk Subsea Controls course in Houston, TX. When I first joined the oil and gas industry in 2008 as a Subsea Controls Engineer, I undertook many internal FMC technical courses to get up to speed on the subsea equipment, to gain an understanding of connectivity and processes for successful integration testing to follow. With time, I built my credibility and became sought after by clients to perform system testing as well as aftermarket service such as identification of control system issues/failures. I was invited to be part of the factory acceptance testing in Nailsea, the UK for a Woodside project, with commissioning service to follow. As a graduate electrical engineer, I undertook Citect, GE Fanuc PLC and PAC training, and became CMS qualified in the management of contractors on site. I completed my double degree in 2006 – Bachelor of Engineering (Computer Systems); Bachelor of Commerce (Accounting). When I was in highschool I undertook Senior Engineering, Maths B and C, Physics and Art. I’ve always loved maths, and have a natural curiosity for all things STEAM. A: When the time came, I had a serious challenge in front of me – how was I to keep my career on track with a new baby on the way? It was a tough question! I wanted to meet this new shift in priorities and responsibilities without having to step away from my role or the resources industry. The answer naturally came to me. At the time, I was physically limited to perform offshore work or work in hazardous areas such as the high-pressure testing bay, so I dreamed up the idea to train our graduates and upskill our technicians to do my role in my place. I felt fantastic giving that time and knowledge that came with technical training and felt empowered that I was enabling my career to continue. I was more than happy to continue my role in technical training when deciding to have a second baby. Job satisfaction was fantastic, and I felt I had a good balance of work and family responsibilities. There is a step change we need to implement and sustain with regards to attracting and retaining a diverse workforce. Dynamic and Flexible Working is a key in achieving sustainable and diverse teams, and I am passionate to lead this program of change for my organization and for industry through my role as Chair for UQ Women in Engineering Alumni Ambassador Council. There isn’t a one size fits all for life, so why would there be one for women in engineering or STEM? A: The dynamic work and projects that I am involved with, means that I constantly face new challenges and I enjoy cultivating strong relationships through effective communication and consultation with diverse teams including frontline, senior leadership, and technical experts. We’re engineers, we like problems because we like to solve them. I am really passionate about continuous improvement and developing strategies that influence digital disruption and technological transformation for the business and sector. A: The resource industry goes through economic booms and busts, so it is good to make sure you are prepared for these times. When a shift in the world’s economics happened, it was clear a mining bust was about to happen, and I realised there wouldn’t be many jobs to apply for post grad program. Knowing there were options available in the city, I sought a control systems engineering role in Perth and landed myself a job as a Subsea engineer in oil and gas. Little did I know, I would go on to spend the next decade in the industry. From the first moment I was dunked in a helicopter crash simulation, to extinguish fires for my BOSIET, I knew life offshore was going to be a different world. I thoroughly enjoyed installation, commissioning, integration and verification testing, and much more field work offshore. When I was requested on demand for an offshore investigation on loss subsea communications and after conducting a deep dive analysis, was able to pinpoint the root cause and confidently present my findings to the operations manager. As one of the only control system female engineers during most of my career, I have always felt that I have needed to work twice as hard for recognition, so this was a proud moment for me in proving my ability to do the job. A: I would tell them to go for their dreams because no one can stop you. Your plan doesn’t need to be perfect because you figure it out as you go. There are many opportunities in the sector, and it’s ok to change your mind. I mean, I thought I would have loved learning mechatronics but did not enjoy mechanical subjects in the degree and found that I had a natural ability to code embedded systems, PLCs and robots.